Although the roughly 1,2001 U.S. regional and superregional malls comprise just 1% of all shopping centers in the nation, they attract a significant and loyal following. 75% of adult Americans—approximately 184 million people—went to a regional/superregional mall at least once in the past three months. These mall visitors went 4.2 times during that period, which equates to 3.1 visits for all American adults. In the past 30 days alone, 63% of American adults went to a mall, making on average 2.3 visits during that time. The youngest consumers surpassed all other mall shoppers both in overall shares of their age segments and in frequency of visits. 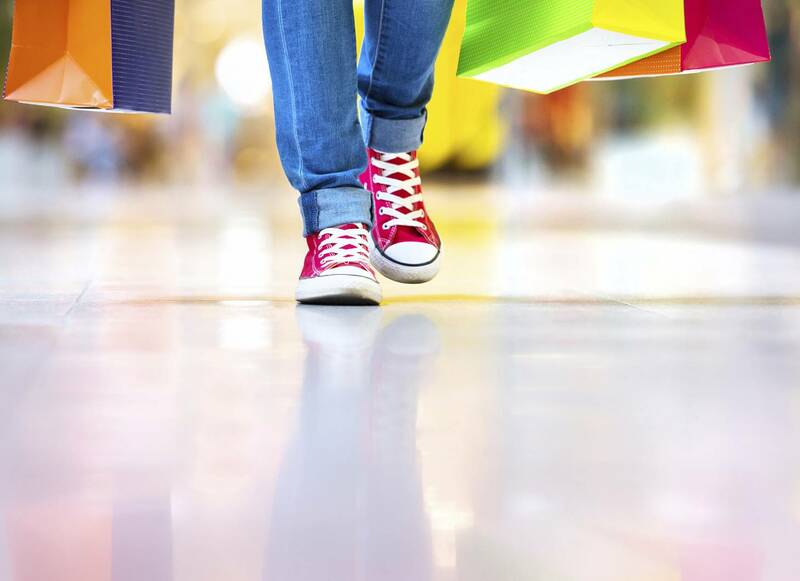 Of 18-34 year-olds who made at least one mall trip, 83% visited on average 4.8 times in the past three months, while 72% of 55-64 year-olds went 3.1 times in the same period. Even within the past 30 days, the same pattern persists: higher shares of the youngest shoppers visited more often than the older cohorts. Shoppers who went to a mall in the past 30 days spent on discretionary goods (such as apparel, footwear, jewelry, electronics and furniture) 48% of the time. For the same percentage of visits (48%), consumers bought food items, household goods or health & beauty products. Among the various services offered, consumers who went to a mall in the past month spent on dining at a restaurant or casual/fast-food establishment 43% of the time. During 22% of mall visits, shoppers spent on entertainment and activities such as movies, bowling, arcades and gyms. For both personal services and all other services (shoe repair, locksmith, banks, etc. ), consumers spent on both of those categories during 13% of their visits. The survey results show that the older age groups spent on goods during more of their visits than the younger groups, while the reverse held true for services, including entertainment and other activities. For example, the oldest age group—those 65 and over—spent on discretionary goods during 54% of mall trips compared with 46% of the youngest (18-34 year-old) group. On entertainment and other activities, the young spent during 27% of their visits in the past 30 days, compared with 13% for the oldest during that time. In addition, spending on personal services occurred during 19% of mall trips among 18-34 year-olds, versus 8% for the oldest age segment. Over half (55%) of the visits made by those in the top income brackets ($75K-$100K and $100K or more) included spending on discretionary goods compared to the lowest income groups who spent during 42% of their visits on these items. On the services side, those with incomes $50K-$75K spent more often than the other groups. Specifically, they dined/drank at restaurants, bars, casual/fast-food establishments during 55% of their visits and 30% of the time, they spent on entertainment and other activities. It should come as no surprise, based on the findings reported earlier, that total spending at malls among shoppers who went within the past 30 days was highest in the goods and restaurant/other food establishment categories. On average, mall visitors spent $156.80 for all types of goods during that period. In fact, 90% of those who visited in the past 30 days spent on all types of goods. Among the various service categories, 79% spent on them. Consumers spent $52.20 on dining/drinking at restaurants, bars, and fast-food establishments and $32.20 on other services and entertainment—a combined $84.40 on all services. In total, for goods and services, shoppers spent $241.20 in the past month at malls or $104.87 per visit. In terms of total dollars spent by age, the youngest cohorts spent the most ($268.10), though not by much, as those 65 years and older spent just $4.10 less. All groups spent more on goods than on services; however, the difference in the amount spent on those varied significantly by age. Younger shoppers tended to spend less on goods than older shoppers, but much more on services. For example, 57% of the total amount spent by 18-34 year olds was on goods and 43% was on services, while 82% of total spending was on goods and 18% on services for the oldest group. Despite the fact that 18-34 year olds spend more than any other group at malls, the two oldest cohorts actually have the highest spend per visit. Those age 55-64 spent on average $140.53 per visit, while shoppers age 65 and over spent $110.00. The youngest shoppers had an average spend per visit of $103.12. Amount of money spent was directly correlated with one’s household income. Top-earning mall shoppers spent 44% more than those earning the least. Males tended to spend more than females in all categories except dining, drinking at restaurants and other food establishments. In total, males spent $248.70 and females $234.70. Not only did consumers who went to malls spend on goods and services, but they also took part in other activities. Survey results show that nearly one quarter (24%) of those who visited a mall in the past 30 days participated in no-fee activities such as recreational walking and/or recreational events for children. Fewer visitors (18%) participated in/contributed to philanthropic campaigns or fundraising such as food drives, clothing drives, monetary donations and 16% attended no-fee events such as fashion shows, concerts, and parades. In terms of frequency, during 17% of their visits, consumers participated in no-fee activities such as recreational walking or recreational events for children. Mall visitors contributed to philanthropic campaigns or fundraising such as food drives 13% of the time and attended no-fee events such as fashion shows, concerts, and parades during the same percentage of visits. This clearly illustrates the critical role malls play within communities serving as social gathering places, creating experiences and fostering charity. The other 99% of shopping centers (114,153)2, which account for roughly 85% of total shopping center gross leasable area, are open-air centers—strip/convenience centers, neighborhood centers, community centers, power centers, lifestyle centers and outlet centers. The past seven days, half of adult Americans (123 million people) visited one of these centers two times on average. Including those who did not go to an open-air center in the past seven days, the average number of visits for all Americans is one. Among visitors to an open-air center in the past seven days, nearly all (95%) spent on goods. The most popular type of goods shoppers bought were food/groceries and beverages, with 84% purchasing in this category. This is no coincidence since many open-air centers (neighborhood and community) are typically anchored by grocery stores or supermarkets and strip/convenience centers often have convenience stores or mini-marts where those items are also available. A little more than three-fifths (61%) of shoppers spent on discretionary goods including apparel, jewelry, electronics, sports equipment, furniture and on other convenience/household goods like building or garden supplies, party supplies and pet supplies. Prescriptions/medications and health supplies were purchased by 42% of open-air shoppers. Nearly six of 10 (59%) spent on services when they visited open-air centers in the past seven days. Leading all of the service categories was dining, drinking at restaurants, bars/fast-food, and take-out with 56% of consumers spending on this. Less than one-third (31%) spent money on other services and entertainment. In total, open-air center visitors in the past seven days spent on average $166.30 on goods and services, or about $83.15 per visit. Nearly three-quarters of the total amount spent was on goods, with the remainder allocated to services. By category, the highest shares of total spending were on food/groceries or beverages (40%), all other types of goods (25%) and dining, drinking at restaurants, bars/fast-food, take-out (17%). About 9% of spending was on prescriptions/medications and health supplies and the same for other services/entertainment. By age, the youngest cohort spent the most in the past seven days at open-air centers ($185.30). The age groups differed less in expenditures on goods than on services. The youngest shoppers spent roughly twice as much as the others on services, which included dining, drinking at restaurants/bars and other food establishments as well as entertainment and other services. These results suggest the willingness of the young to spend on experiences and are likely a result of going to the movies and engaging in social activities. Spending by income showed a different pattern, with greater differences in expenditures on goods than on services. Shoppers in the top earning households spent 1.8 times as much on goods than those with the lowest income. On services, the most affluent group spent $13.90 more than the amount among the least affluent. Aside from dining, drinking at restaurants casual/fast-food establishments or bars, consumers purchased goods more frequently than services. Open-air shoppers spent during 40% of their visits on regular grocery shopping. In the same percentage of visits, they also bought necessities such as milk or bread. Discretionary goods, other convenience/household goods, and building/garden supplies were purchased during one-quarter (25%) of open-air visits. One-fifth of the time (20%), shoppers picked up prescriptions/medications and health supplies. Leading all services, consumers dined at a restaurant or casual/fast-food establishment, or spent on take-out about one-third of the time (30% of visits). During 15% of their trips to open-air centers, shoppers spent on personal services and entertainment. One in 10 times, they spent on other services including locksmiths, shoe repair, and medical. Consumers continue to benefit from the advancing omni-channel environment by becoming better informed about choices, prices and locations of products and the retailers that sell them. The survey indicated that 56% of American adults did research online prior to visiting a store to purchase discretionary goods. Shopper research online ranged from 63% among 18-34 year-olds to 45% among those 65 years and older. A slightly higher share of males (60%) researched products online compared to females (53%), and among the income groups, those in the top bracket ($100K and over) had the highest share of people (63%) researching online compared to half (50%) of the $35K-$50K bracket—the lowest share. Approximately two-thirds (66%) of Americans use mobile devices while shopping in store. Use of these devices correlates directly with age, with a high among the youngest cohort (87%) and falling with each succeeding segment until reaching the oldest (37%). In addition to being places where people gather to shop, socialize and have fun, shopping centers are also a source of employment for millions of people. Three of 10 survey respondents either work or have had a household member work in a shopping center. This would mean that approximately 74 million Americans have been employed at some point in the shopping center industry. This includes workers in retail, service or restaurant establishments located in either open-air centers or malls. Currently, total shopping center employment is approximately 12.8 million3—roughly 9.0% of total non-farm employment and 82% of total retail employment. These numbers show that shopping centers are crucial for sustaining communities and creating economic growth. Americans visit shopping centers enough to make this the nation’s first and foremost marketplace. But it is not merely a place where consumers can purchase goods. As the results of this most recent survey demonstrate, it also fulfills a function that has endured throughout history: a crossroads where people can buy what they need or want, secure needed services, relax, or work. As those impulses persist, so does the great gathering place that accommodates them.